If you are looking to align your life with your passion or simply honour yourself and develop your personal practice why not commit to delving deeper into the philosophies and practices of your chosen art. We are proud to host trainings and immersions led by The Yoga Barn teachers as well as visiting internationally renowned teachers, to offer a collection of transformational experiences. Whether you want to immerse yourself in Yoga, Meditation, Philosophy, Breathwork, Sound, Reiki or Astrology, we have a training or immersions for you. 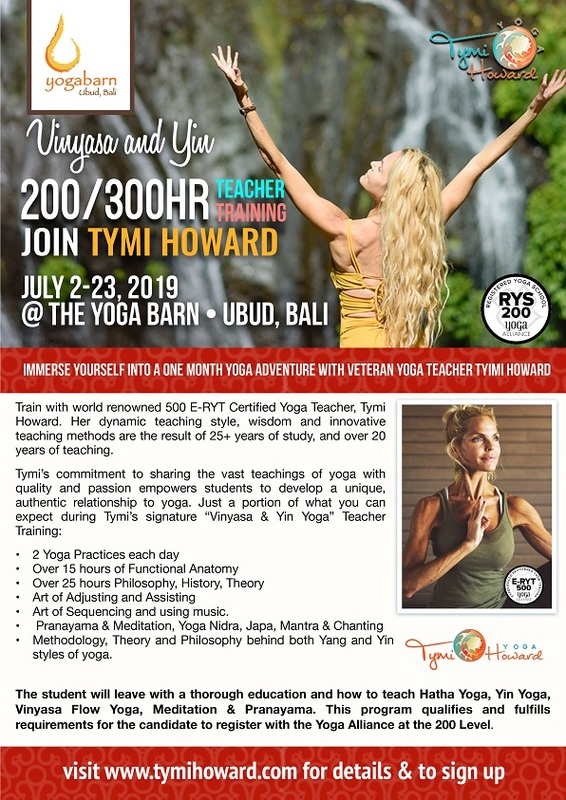 Each training and immersion is developed and run by the teacher themselves but fully supported by our tropical yoga studio and holistic healing retreat centre in Ubud. The programs vary from two-week immersions across a variety of topics, to Yoga Teacher Training courses for 100, 200 and 300 hour accreditations. All of the options offer a unique teaching syllabus, style and qualification so it’s important to find the one which resonates with you. We encourage you to take some time to think about your intention for a training or immersion and explore our 2019 Training Calendar to read more about what is on offer. 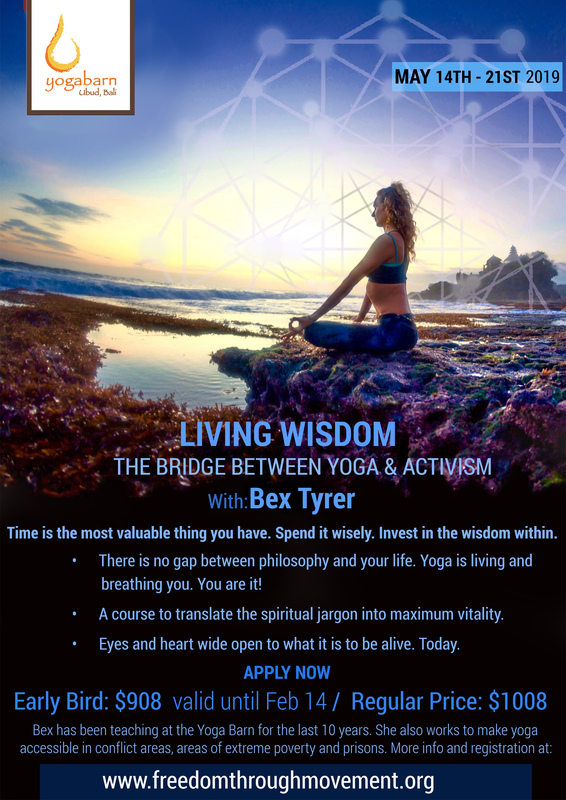 Tune into your heart, act on your intuition and then follow the link to find our more from the teacher and course that is best suited to you and your goals. Known as a Teacher's Teacher, Jo Phee is the Master Trainer and Senior Assistant of Yin Yoga founder, Paul Grilley. 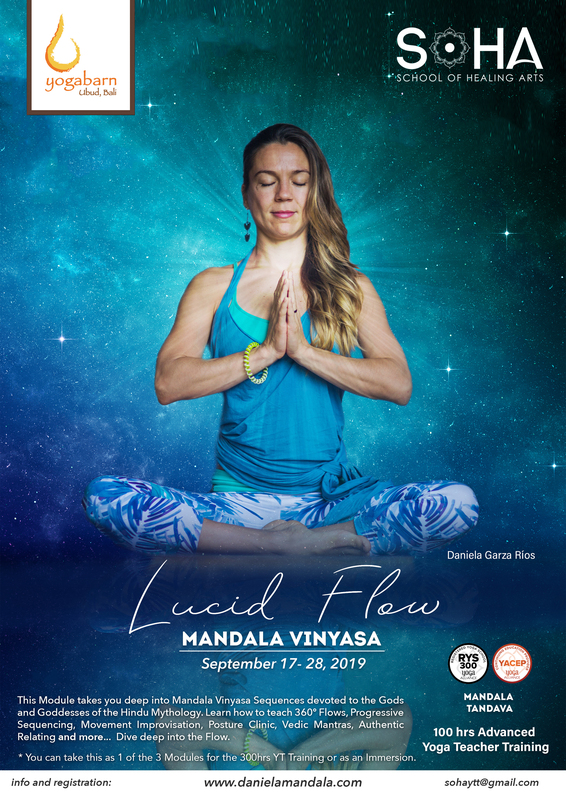 She travels around the world presenting the Yin Yoga curriculum as taught by the founder and has taught over 70 Yin Yoga Teacher Training programs worldwide. In this module, you will learn how to incorporate Qigong into a Yin Yoga class, with a special focus on the Common Treatments of Medical Qigong and the Acupuncture Meridian Qigong series. The Qigong sessions will be led by a Master Qigong Instructor. You will also study all the original Yin Yoga poses and sequencing as taught by the founder Paul Grilley. This training will sell out quick. Book in soon to secure your spot. We offer a perfect balance of technique, spiritual practice, and the integration of sacred tools for transforming, healing, and embodying our highest potential. Postures, Alignment, Anatomy, Vinyasa Krama (intelligent sequencing), Adjustments, Ancient Philosophy, Energetic Awakening, Yin Yoga, Mandala Vinyasa, Teaching Methodology, Meditation, Acroyoga, and Thai Yoga Massage. This TT is a process of deep transformation. We will experience active and divine creativity manifesting the magic that unfolds. Why are we attracted to the types of people that we usually are? This is NOT Sun sign astrology and is NOT predictive. Shamanic Astrology is a paradigm which blends global astrological traditions and knowledge to create a practical and experiential system for the current age. 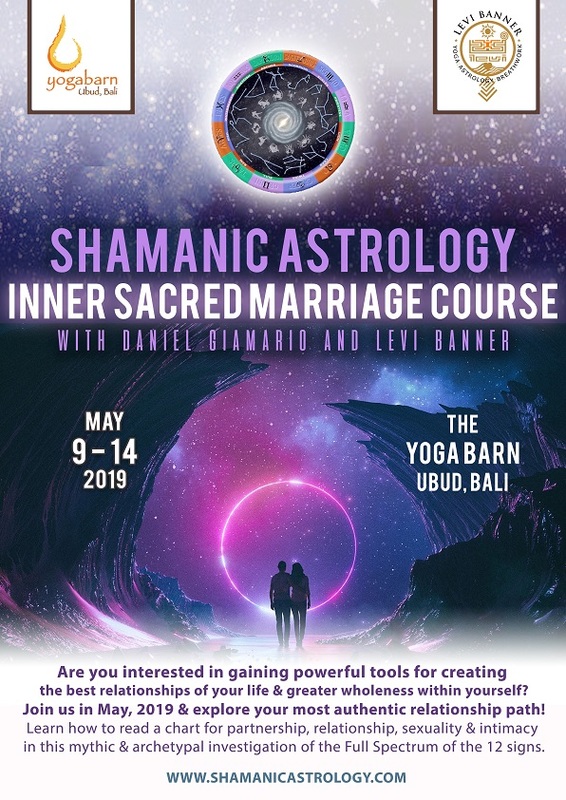 This is one of the basic courses offered by the Shamanic Astrology Mystery School™, and is being presented by the founder of the school and the creator of the Shamanic Astrology Paradigm™, Daniel Giamario. Are you interested in gaining powerful tools for creating the best relationships of your life and greater wholeness within yourself? Join us in May, 2019 and explore your most authentic relationship path. Yoga gives us a way to be responsible for our own physical, emotional and spiritual well being. Often times, the challenge is how to put the theory into practice. Once “activated”, yoga gives us a way to really get to know ourselves. It is a way to move from being at the mercy of old survival strategies and core wounds to revealing our most intimate desires, hidden talents, our wildest dreams. Yoga is a way to become deeply engaged with our life from the level of our work, relationships and inner world. It takes courage to feel the intensity of what it is to be alive in 2019, and to have the wisdom to know how drop external mandates and decipher what is really important. Once we are able to step into this state of being, we are already to see the value of committing to living a life free from suffering yet unafraid of feeling the whole spectrum of emotions from pain to love and beyond. Fear of failure melts away, and all we can do is our best. Sometimes thats beyond enough, sometimes we fall short. We let life teach us. We share the lessons and blessings. In 8 days you will gain a deeply informed perspective of Yoga which cuts through the spiritual jargon and dives to the heart of what Yoga is all about. There will plenty of time to develop your physical practice, grasp a thorough understanding of the main themes of contemporary yoga and gauge how it links back to the ancient roots of this wisdom tradition. If you are already teaching, then this will help you share your passion with others in a humble, no bullsh*t and deeply relevant way. This course offers a totally different perspective on Yoga and the way in which we can gear our practice and teachings to the modern women and support optimum health in the body-mind system. Dive deep into all Major Aspects of Yoga & Learn to share your Knowledge with others. Routes of Yoga's 200hr Teacher Trainings are comprehensive and holistic programs that cover all the major aspects of yoga in both practice and in theory. Experience the process and applied science of yoga while cultivating a solid teaching methodology rooted in practice and authenticity. 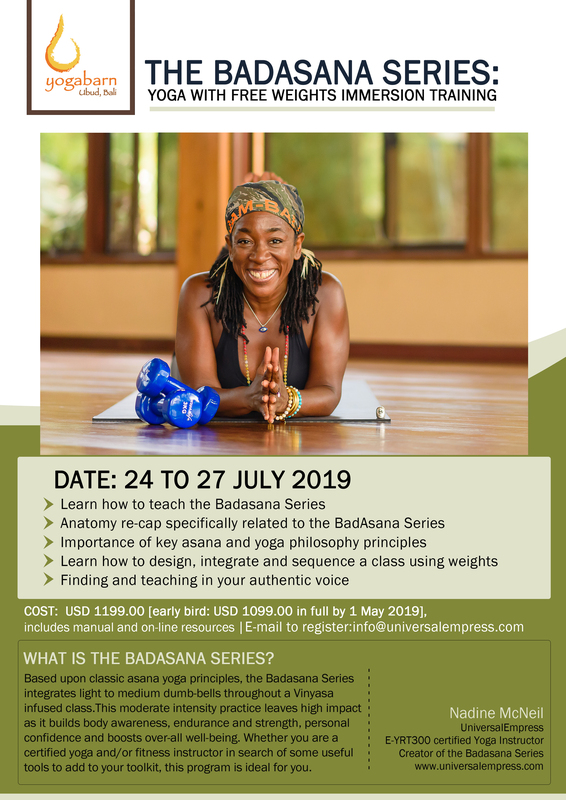 Challenge yourself by immersing into a full intensive of lectures, workshops and yoga classes mindfully crafted together to enhance your learning experience and understanding of self. Refine your yoga practice with effective tools directly applicable on and off the mat and use this incubation space to cultivate a loving and intimate relation to self. Join our skillful and nurturing ROY teaching faculty in a safe and supportive space. Learn to walk the fine line between ease and moving through challenge gracefully as you dedicate time towards devotion and nourishment of spirit. 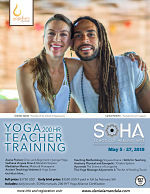 Routes of Yoga’s training programs focus on the awareness and cultivation of universal principals that are inherent across various styles of yoga. You will learn how to apply these principals to enhance your yoga practice as well as teach across different class styles and levels. This inclusive approach empowers you to make practice choices based on your condition and state of mind on a given day as well as share yoga with others from a place of relevance and suitability of the individuals on the mat that are in your care. ROY encourages bare feet on the earth and heads high up in the clear vast sky. Likewise our training programs are as practical and grounding as they are inspiring and devotional, be prepared to Journey in & Expand Out! It is with great pleasure that Punnu offers the most comprehensive 100-hour & 200-hour meditation teacher training available in Bali. He is excited to teach a very high-quality course and share his knowledge and experience of more than 31 years that has wide application and maintains both psychological and spiritual depth. You will deepen your personal meditation practice and receive many ancient and powerful tools for your personal life while gaining the confidence and skills to teach mindful meditation to others. Check Punnu’s website www.punnuwasu.com for further information and early bird price. This is a 200 hours Comprehensive Yoga Teacher Training Program that will cover the practical, theoretical, historical, and spiritual aspects of the Science of Yoga. It can be used towards a 200/300/500-Hour Registration with Yoga Alliance. The program requires considerable energy, time, dedication, and commitment. The student will leave with a thorough education on how to teach Hatha Yoga, Yin Yoga, Vinyasa Flow Yoga, Meditation & Pranayama. The candidate must have a dedicated personal practice, heightened awareness, and an abundance of inspiration and passion, that will fully prepare them to share the gift of yoga. Unlike most trainings, you will spend almost all of your contact hours with the principal teacher, Tymi Howard 500 ERYT. Tymi is the Creator/Director of Guru Yoga Studios 200, 300-Hour Teacher Trainings as well as a sought-after International Teacher, and Festival Presenter. Her dynamic teaching style, wisdom and innovative teaching methods are the result of 25+ years of study, and over 20 years of teaching. Tymi’s commitment to sharing the vast teachings of yoga with quality and passion empowers students to develop a unique, authentic relationship to yoga. The training offers a world-class education, grounded in the wisdom of experience and empowered professionalism and self-inquiry. Expect to be at the studio from 8:30am-6:30pm Monday thru Saturday with Sundays off for rest and/or Specialty classes, workshops, meditation and self-practice time. *FIRST DAY of Classes is Tuesday, July 2nd and GRADUATION is Tuesday, July 23rd, 2019. WHAT IS THE BADASANA SERIES? Based upon classic asana yoga principles, the Badasana Series integrates light to medium dumb-bells throughout a Vinyasa infused class. This moderate intensity practice leaves high impact as it builds body awareness, endurance and strength, personal confidence and boosts over-all well-being. Whether you are a certified yoga and/or fitness instructor in search of some useful tools to add to your toolkit, this program is ideal for you. Born and raised in Kingston, Jamaica, Nadine lived in Canada and the United States before joining the UN in 1986. During her 22 years with the organization, her assignments included stints in Sudan, Iraq and Kuwait, and in 2004 she served as head logistics specialist for UNICEF in response to Indonesia’s tsunami. After the earthquake in 2010, Nadine led Global Volunteer Network initiatives in Haiti, and has also worked in the Netherlands with the Organisation for the Prohibition of Chemical Weapons. These and other experiences rooted Nadine’s continued devotion to activism. The Forrest Yoga Foundation Teacher Training is a 27-day teacher training which encompasses 22 days intensives and teacher training, a 3-day Functional Anatomy for Yoga Teachers course and a 2-day Forrest Yoga Business Course is a comprehensive program for aspiring teachers, experienced teachers or yoga students who want to work deeper within themselves. This teacher training meets the 200-hour Yoga Alliance Registered Program requirements and is the foundation starting point for new teachers and the first step to becoming a Forrest Yoga Certified Teacher. Yoga legend Ana Forrest and Musical Shaman Jose Calarco offer profound experiences and a vision quest for something truly sacred in life. In their unique style, Ana and Jose combine intelligent pose sequencing with a spiritual intent. 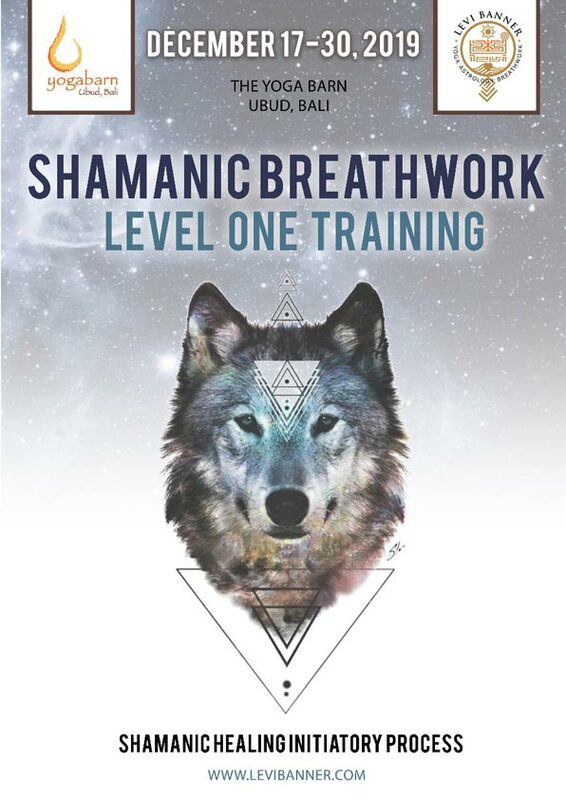 This training is a blend of music, song, invocation, smoke blessing , storytelling, prayer, philosophy, and primordial and shamanic healing practices. Ana and Jose teach the art of evolving the self and establishing a connection with Spirit and Nature. 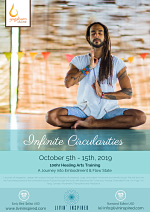 You will meet your edges, experience deep transformation, and connect to the worldwide tribe of Forrest Yoga teachers. You will leave this training better equipped to deal with your challenges in teaching and in life. After 100% completion of the course, you will be eligible to register with Yoga Alliance as a RYT-200 Yoga. The Yoga Therapeutics Teacher Training is created for experienced yogi's & yoga teachers, wanting to take either their personal &/or teaching practices to the next level. To discover more depth, specificity & understanding of the distinct therapeutic benefits of yoga asana, on the Body, Mind & Spirit. We will learn how to tailor our yoga practice to meet our specific individual needs, moment to moment, physically, mentally & emotionally, throughout the changing seasons of our lives, & the lives of our students. 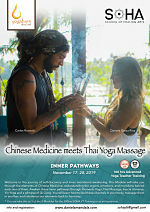 TNYT Yoga Therapy is a healing system of therapeutic yoga that incorporates the wisdom of the Five Element Meridian System of Traditional Chinese Medicine & the Taoist Healing Arts of China & Japan, with traditional Indian Hatha Yoga Asana. In this training you will learn the precise therapeutic benefits of each of the hatha yoga asana's, discovering which organs are influenced directly by particular meridian pathways, accessed purposefully in each posture. Both Yoga & Taoism recognise that the microcosm of our body represents the macrocosm of nature. Each of our organs are governed by the elements of nature & our bodies echo the changing patterns of the seasons. In this training you will learn how to assemble, practice & teach therapeutic yoga practices for each of the the five elements; Metal, Water, Wood, Fire & Earth, congruent with each of the five seasons; Autumn, Winter, Spring, Summer & Late Summer. We will learn how to recognise postural implications of chi imbalance in ourselves & our students on & off the mat. And to create individualized therapeutic yoga programmes, incorporating asana, breath, nutrition & lifestyle support, for specific pathologies, imbalances & holistic individual needs. You will learn how to work directly & effectively with each of the 12 primary organ systems of the body, by vitalising the 12 main meridian pathways, optimising chi flow through the energetic system & influencing physical, psycho-emotional & spiritual health & well-being. 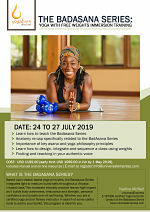 This 100hr module, is a complete & thorough study unto itself, or may be a contributing module to the TNYT 500hr RYT Advanced Yoga Teacher Training Programme. Embodied Flow™ is the Science and Art of weaving embodied anatomy with alignment based hatha yoga in order to move into the ever-deepening awareness of our consciousness. Embodied Flow™opens a door to the transformative aspects of yoga, taking asana and other practices beyond a formulaic external approach into the Living Art of Yoga™. Embodiment Practices inspired by Body Mind Centering® – tapping into the felt sense of different systems of the body: skeletal, organ, endocrine, muscular, developmental, nervous system in order to gain awareness, registry and resonance of these systems. This Module has the objective of teaching the methodology, teaching techniques and mythology behind Mandala Vinyasa. A deepening of the practice with respective kriyas and pranayamas will open the door to inner exploration as to embody and create your own vision of your path. We will learn how to create intelligent mandala sequences, as know how to correctly design safe and progressive practices. Magic comes into mythology, giving powerful insight and depth to the intention behind the teachings. We will unfold the vedic mantras as we offer the dances to the Gods and Goddesses archetypes. This is the perfect training to learn how to teach and embody the flow. A journey of integration, realign with source through the practice of presence, yoga, embodied movement and mindful touch. We will dive into the Fascinating world of the connective tissue (Fascia) through the body with practices like Conscious Vinyasa, Embodied Flow, Yin Yoga, Yin Yang, Somatic Movement, Pranayama and Meditation. The direct experience of flow will set the foundation for the process of embodiment to take place within, which will be the playground in the bodywork sessions (Thai Yoga Massage meets MioFascia release), with the intention to integrate this knowledge into the Art of Self Healing & Healing Touch. 10% discount for joining 2 levels or more. Gift yourself the opportunity to learn the restorative healing energy work - the Art of Reiki. Reiki is renowned for deep relaxation, stress relief and natural healing. It is a simple and powerful "laying on hands" energy balancing technique which is based on the idea that an unseen "life force energy" flows through us and is what causes us to be alive. If one's "life force energy" is low, then we are more likely to become sick and if it is high, we are more capable of being happy and healthy. Feelings of tranquillity and peace are often experienced after giving/receiving Reiki sessions along with a renewed capacity to cope with the pressures of our busy daily lives. This course is taught according to the tradition of Dr Mikao Usui Sensei. The Training may be taken as a 1-5 day course, culminating in Grand master Certification. You will receive a Reiki manual for each level and a certificate. Punnu Singh Wasu is a certified Grand Master in Reiki and has over 24 years of experience. He studied different traditions of Reiki with Grand Master, Kandy Beth Brandt in Russia and with Dr. Kanta Nagpal in India over several years. He offers Reiki sessions on a daily basis and private/group trainings on a regular basis around the world. For female therapists, psychologists, yoga teachers and all women interested in learning a self-care program designed specifically for women. Learn to take care of you first. Especially if you are taking care of many others. You will leave this training feeling clear, revitalized, supported…and inspired. The skills, techniques and creativity cultivated in this training will become a gift to share with your female clients, patients, students, family and friends. 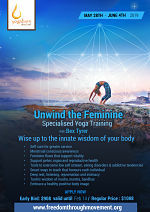 Enjoy a fresh and honest education about women’s sexuality, physicality, psychology and spirituality — including understanding pleasure, menstrual reclamation, embracing fertility, honoring and supporting menopause, developing self-esteem, healing depression and eating disorders, and busting cultural taboos around the female body. Teaching Methodology – 25 hours ~ Includes principles of demonstration, observation, assisting and correcting, instruction, teaching styles, qualities of a teacher, the student’s process of learning and business aspects of teaching yoga. Female Anatomy & Physiology – 20 hours ~ Includes both female anatomy, sexual anatomy and physiology (bodily systems, organs, etc.) and energy anatomy and physiology (chakras, nadis, etc.). Includes both the study of the subject and application of its principles to yoga practice (benefits, contraindications, healthy movement patterns, etc). Philosophy, Ethics & Lifestyle – 30 hours ~ Includes the study of Tantric philosophies, self-care lifestyle and self-empowering ethics. Practicum – 10 hours ~ Includes practice teaching, receiving feedback, observing others teaching and hearing and giving feedback. Also includes assisting students while someone else is teaching. Electives – 15 hours ~ Reading, self-practice, writing, etc. Hours accumulated outside of teacher training hours as ‘non-contact’ hours. All of the above exceeds daily International Yoga Alliance requirements in: Female anatomy, philosophy, asana, meditation, pranayama, practicum and ethics. Welcome to the journey of self-discovery and inner meridional awakening. This training will take you through the Elements of Traditional Chinese Medicine, understanding the organs, emotions, imbalances, and meridians behind each one of them. This module will guide you to discover these inner pathways and awaken the meridians through Yoga, Thai Massage, Fascia, and glimpses of Qi Gong. You will learn to feel these channels in your body, massage them in another, and understand how to bring these back to harmony. 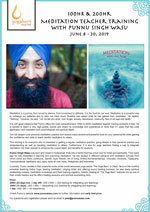 Are you passionate about Kirtan and singing from the heart? Devotional Kirtan singer and music teacher, Punnu Singh Wasu invites you to his 5-day heart opening and soulful Kirtan intensive training. This is a unique and transformational opportunity to study ancient devotional mantras and Indian Classical Music with a Kirtan master of more than 40 years of experience for both beginners (no previous musical experience is necessary) as well as for Kirtan leaders who want to refine their skills. 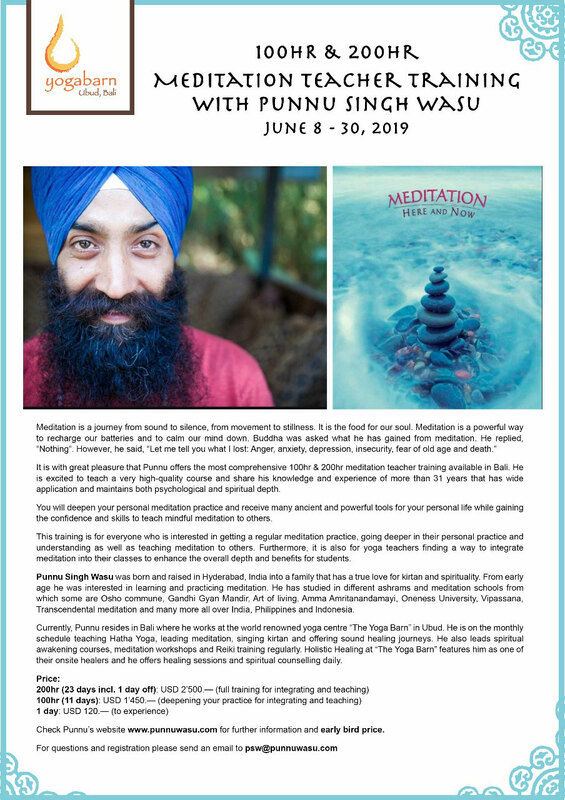 Experience the benefits of ancient sacred mantra repetition as applied to chanting and meditation, enjoy the ecstasy and deep spiritual fulfilment of the ancient Bhakti Yoga practice, learn Sanskrit and Gurbani from Sikhism (Kundalini) chants, their proper pronunciation and meanings. You will gain insight into Yoga philosophy in Bhakti, traditional Indian deities stories and practices. Learn the instruments used for Kirtan, and explore the possibilities to create your own amazing chant compositions. Check Punnu’s website www.punnuwasu.com for further information incl. early bird price. Training can be booked from 1 day up to 5 days. In this Module, we are deepening into the Philosophical realms and the root teachings of Yoga. Teachings from the Bhagavad Gita, and the traditional Puranas will be unfolded. Here is where we walk into the path of ritualizing life. We will go through the art of Puja, Meditation and Pranayama techniques that enhance the experience. This is a perfect training to awaken devotion towards Knowledge of the Self. 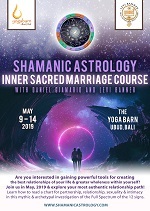 Join us in beautiful Bali for a transformational journey through the ceremony of Shamanic Breathwork - a powerful healing process that inspires individuals to reconnect with their own inner healer. 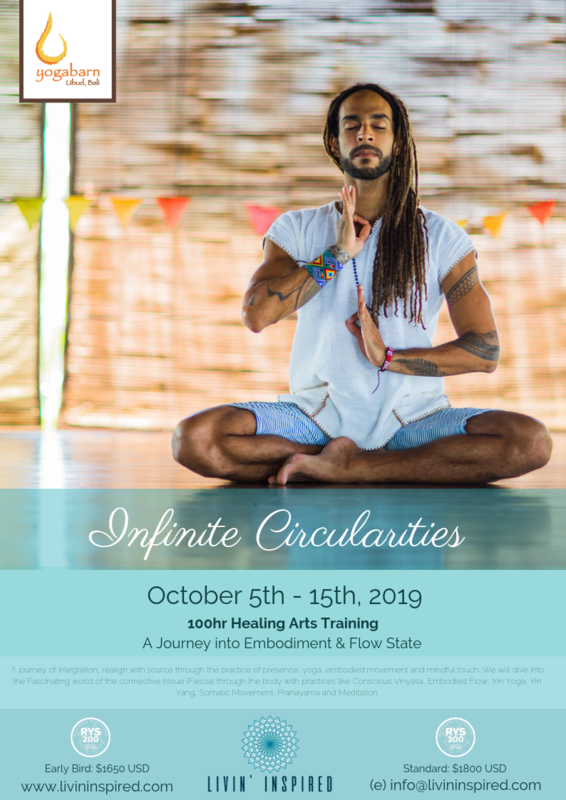 It’s a journey taken by connecting the breath, chakra-attuned music, focused bodywork, art, and group sharing to leave you empowered with the magic of who you truly are. 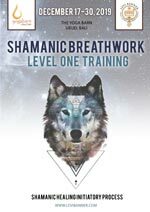 Through Shamanic Breathwork, old wounds and dysfunctional patterns are released and transformed, bringing wholeness and healing back into your life, your loved ones, and the world around you. This 14 Day immersion will take you through the Shamanic Healing Initiatory Process (SHIP). The program is a series of five transformative initiations based on the 5 Elements. This highly experiential process taps into your inner self, releasing blocks to higher love and wisdom. As you re-integrate through embodiment of the 5 Elements, you will be set free to stand in the truth of your authentic being and walk a path with heart. You will journey beyond the limitations of ego identity and shape-shift into your sacred soul purpose. Are you ready to step onto the shamanic path of transformation? Are you ready to journey into personal healing through the power of the breath? Are you ready to change your life in magical place brimming with spiritual energy?